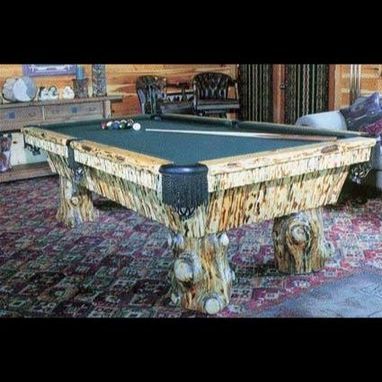 Skip-peeled logs give this version of our Teton pool table a look all its own. Teton Tables are available with plain sides (as shown) or with copper-etched custom artwork on the side and end panels. Shown is Standard style. The skip-peeled finish shown here is an alternative o our normal stain processes. The Teton is also available in any of our standard stains and finishes.